Mountain biking is on a complete and total tear right now, and we are loving that trend. To help fuel the surge, we asked riders at two of the north’s destination bike shops, Spencer Nemecek at Latitude 45 in Petoskey and Cody Sovis at Einstein Cycles in Traverse City, for 10 Northern Michigan mountain bike trails they’d recommend to friends—good friends. Map ’em out, check ’em off. You can thank us later. 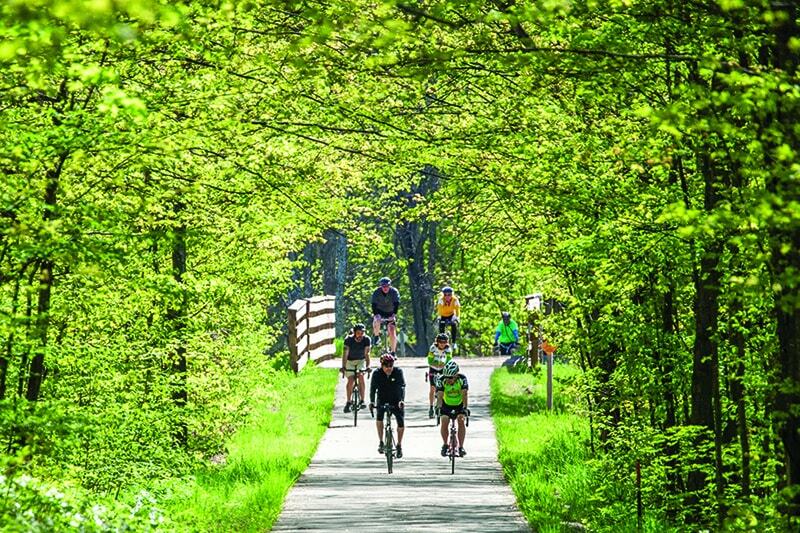 Round Petoskey way, the more northern sections of the North Country Trail deliver flatter terrain that’s ideal for beginners, intermediates and families. Park where the trail crosses Kip Road and head north. A notable climb starts things off, but then the trail levels out. South of Petoskey, the North Country Trail gets tougher, with huge, quad-burner climbs. Take US-131 south to Bear Lake Road. Turn east and follow to where the road veers to become Maxwell. Park where the trail crosses Maxwell Road and follow the trail signs. The afterglow: Petoskey Brewing, Petoskey. The Boyne school system offers mountain bike trails on a chunk of forest it owns (Go Boyne schools!). “It’s flowy and easy, but is still fun for people who can rip downhill runs, too,” Nemecek says. Look for an advanced loop to be added soon. 3.7 miles of trail (expanding to 11 miles). From Boyne City, go north on Wildwood Harbor Road to Erickson. Left on Erickson. Park a few hundred yards past where Erickson intersects Griffen. The afterglow: Barrel Back, Walloon Village. With a badass trail system right in its midst, Boyne City makes an ideal locale for an afternoon ride and post-trail bevs. What Nemecek likes here: “There’s a big climb and then the descent back is awesome.” Avalanche is an older trail, so not especially flowy, but the terrain makes up for it. A longer, less steep trail to the top is also an option. Total trail length 4.8 miles. The International Mountain Biking Association is building more trail, which will be well engineered and more flowy. The afterglow: Red Mesa, Boyne City. Sovis and Nemecek both recommend this one. “The community is really behind Glacial Hills and keeps it really well maintained,” Sovis says. And Nemecek’s take: “A ton of trail and it’s really well done.” Expect 31.5 miles of well-engineered, flowy trails. Accessible enough for beginners, attitude enough for experts. For the afterglow? “You can ride till you are smoked and then go to Short’s Brewing,” Sovis says. Only 2.5 miles northwest of Bellaire. A nice mix of terrain and trail lengths makes Hanson Hills good for all skill levels. Flat at the start, followed by decent hills. A bit sandy at times. “Pretty well engineered,” Nemecek says. Total trail 24 miles. A mile southwest of Grayling. The afterglow: The Silver Dollar, Higgins Lake. Near Traverse City, the big obvious go-to trail is the Vasa, but the trail also has a not-so-obvious and exquisite extra. First, the obvious: Choose between riding the 15 miles of relatively wide XC trail (cut wide for skate skiing), which is ideal for beginners and families, but can be fun for riders looking to hammer it (trailhead off Bartlett Road, Williamsburg). Or opt for the 12 miles of easy to moderate single-track (trailhead off Supply Road). The not-so-obvious bonus, says Sovis: miles and miles of bootleg single-track that twists through a 16-square-mile swath of Pere Marquette State Forest. Bring a compass, but don’t worry, you can’t get too lost, because the section is bordered by highways—you’ll hit one eventually. Six miles east of downtown TC. The afterglow: Brewery Terra Firma, south of Traverse City. Just a couple miles of trail here, but the accessibility—right in TC—combined with the terrain—hilly!—make this bite-sized bit of backcountry a local riders go-to destination. Perfect for after-work training and finding camaraderie with fellow pedalers. Bonus: “There are some steep descents, especially for younger riders on dedicated downhill bikes. Big jumps and big gaps. Nothing I’d ride, but it’s fun to watch,” Sovis says. A mile west of downtown TC. The afterglow: Wine? After mountain biking? Don’t defy us. Left Foot Charley’s deck, right at the Commons. Outstanding. A lovely and professionally engineered and constructed trail a couple miles north of the tiny burg of Arcadia, near the Lake Michigan shore. Roll across 8.2 miles of hilly terrain on flowy trails. “You can easily spend three or four hours here,” Sovis says. (Expand the ride by parking in Arcadia, a couple of miles south and ride gravel roads to the trailhead.) Take M22 to St. Pierre Road; turn east, parking 100 yards down. The afterglow: Stormcloud Brewing, Frankfort, 9 miles north. A robust mix of terrain—flats, sustained climbs—and 33 miles of trail make this system appealing to anybody. Trail style is a mix of XC trail, two-track and single-track. Those looking to take on a long day of riding can do so here. Twelve miles east of Manistee off Udell Hills Road. The afterglow: Goody’s Juice and Java, downtown Manistee. Expect solitude, lots of elevation changes and marvelous views of the river valley through the filter of pine and hardwood forest on this stretch of the NCT. “It’s a little bit rougher, a bit more isolated,” Sovis says. His advice: pack plenty of water, energy snacks, tools and a flat repair kit. Park at Marilla Road trailhead, near Mesick. From M115, turn southwest on Hodenpyl Dam Road, go 5.5 miles, look for trailhead. Pedal south to Dillings Road. Do an out-and-back ride. 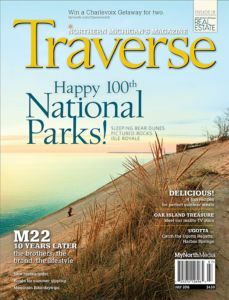 These Northern Michigan mountain bike trails were originally featured in the July 2016 issue of Traverse, Northern Michigan’s Magazine.